Two new products from Sescoi complementing the recognised capabilities of the company’s open WorkNC Dental CADCAM software will be launched at the International Dental Show (IDS) in Cologne, on booth F051 in Halle 11.1. The new automated WorkNC Dental Implantology module will make it easy to machine bridges and align them to implant fixings irrespective of their orientation, while the new WorkNC Dental Automation module will automatically manage machining jobs and monitor machine operations. Partnering Sescoi at the show will be DentalWings, Willemin Macodel, Datron, Witech and Roland. Additionally, there will be live machining demonstrations on the Sescoi booth, running on a Datron machining center. WorkNC Dental enables scanned dental casts to be manipulated and machined with virtually one mouse click. Machining wizards consider the material being cut and the kinematics of the machine tool, optimizing the toolpath methodology for individual materials including titanium, chrome cobalt, zirconia, lithium disilicate, E-max and PMMA. The new WorkNC Dental automated implantology module detects the 3D orientation of each implant in the patient’s jaw, as well as the geometry of the prosthetic bridge or crown and the position of the margin line. The automatic and accurate 5-axis machining of the digitized information with WorkNC Dental ensures a very high quality fit for the finished prosthesis. Perfect alignment to the supporting abutments or implants makes the bridge easy to install, and will result in reliability, durability and customer satisfaction. Sescoi’s new WorkNC Dental Automation module provides automatic pallet handling, project management and scheduling that queues a series of jobs, and allocates them according to pallet availability through direct connection to the machine tool controller, turning prosthesis manufacture into a virtually continuous and unmanned operation. Visitors to IDS will be able to see simulations of WorkNC Dental Automation on the Willemin Macodel booth (L020/M021). 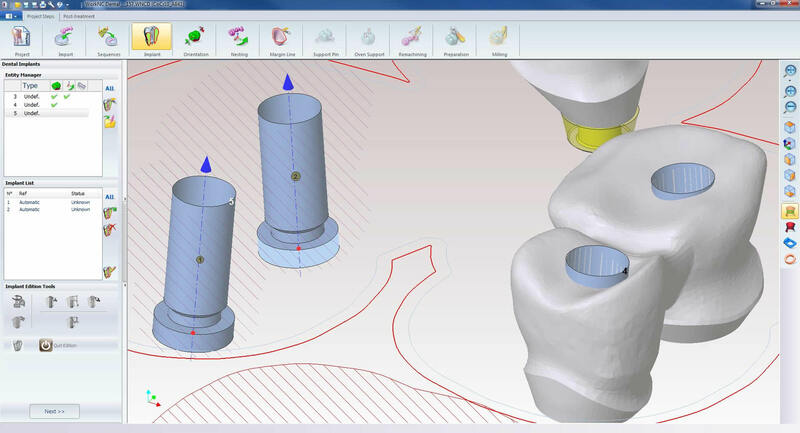 Sescoi specializes in creating automated CADCAM software, so this has naturally been a key design principle in its development of WorkNC Dental CADCAM software. Dental technicians do not need to have CNC machining experience and can rely entirely on the intelligence built into the software to produce safe, collision free toolpaths dedicated to each specific type of dental restoration and material. The range of collaborative partners working with Sescoi reflects the true spirit of an open system, allowing dental professionals to choose equipment which is technically matched to their requirements and which is cost effective.